Pacific ponderosa pine is a lovely tree native west of the Cascades from about the Portland area (with some outliers farther north) south to Baja Norte, Mexico. Our form is from locally collected seed. Slow growing in youth this pine picks up speed in its teens and grows almost exponentially from there. 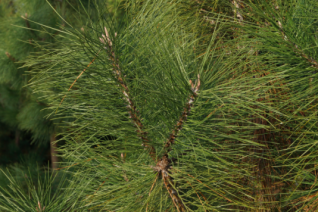 Pacific ponderosa pine is known for it tall straight crowns of lush green needles in clumps of two. This tree is excellently adapted to our winter wet/summer dry climate and even small trees can endure the very longest, driest, hottest summers with no visible stress. Its adaptable to all types of soil – not fussy and is even found in the most well drained stranded flood cobbles of major rivers. To 125′ in time with ulitimate height of close to 200′ in great age – expect a 3′ tall tree to be about 15′ tall in 10 years. Full sun- not very shade tolerant and when planting with other trees anticipate at least a 25′ wide crown in the future. Needles can drop profusely in September which is a bit of a mess. Take note of this. Underplant with other drought adapted natives. Water to establish for the first summer then none in subsequent years. A regal pine that is among the tallest in the world. Oregon native plant. Gray Pine or Foothill Pine native almost exclusively to the mountains of California- but there are several outlying native populations in Jackson, County Oregon so we can claim it as our own as well. Known as the tree that casts no shade, its almost completely true as the long gray needles allow almost all light through. 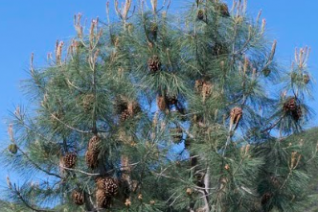 Large pine tree with gray foliage- usually forks about 1/2 way up into two main trunks, these are buttressed to support the huge cones which can weigh 5lbs or more. Excellent performance in the Willamette Valley where many are seen around old farm houses and older neighborhoods. Perfectly hardy to cold in our climate and incredibly drought adapted. In fact it shuns all irrigation and is ideal for hot dry locations. Grows very fast in youth, settles down a little with age. Its ultimate height is around 35′-45′ in our climate. A smokey, silvery, shadeless skyline tree. Oregon native plant.